Bottlenose dolphins in Louisiana's Barataria Bay are still suffering from a host of maladies, including lung disease and adrenal problems, in the wake of the 2010 Deepwater Horizon spill in the Gulf of Mexico, researchers say. 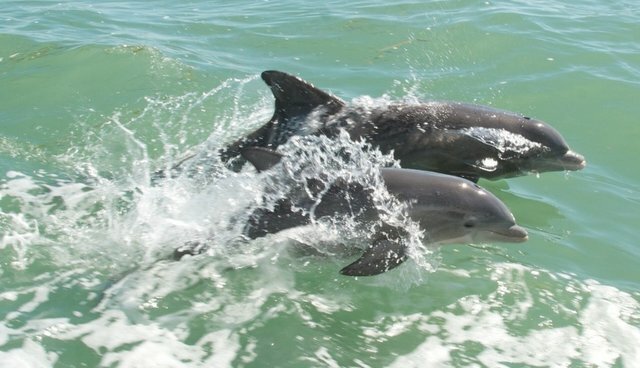 For a new study, scientists compared the health of dolphins in the area to those around Florida's Sarasota Bay, finding that the Louisiana dolphins were underweight and had low red blood cell counts, lung disease, pneumonia and were losing their teeth. "There's disease in any wild population," said lead researcher Lori H. Schwacke, branch chief of the National Oceanic and Atmospheric Administration's Centers for Coastal Ocean Science. "But we just haven't seen animals that were in such bad shape as what we saw in Barataria Bay." Barataria Bay was hit heavily by the oil spill, which released millions of gallons of oil into the gulf for 87 days. The dolphins come into contact with oil through their skin, through eating contaminated fish and through inhalation of contaminated air, according to the Washington Post. They were also alarmed by the incidence of tooth loss they saw in many of the animals. "The extensive loss of teeth in their entirety and often without evidence of wear in remaining teeth in both young and old dolphins was unexpected," the researchers wrote. The team found that the damage was severe in comparison to other dolphins -- Barataria Bay dolphins were five times as likely to suffer from moderate to severe lung disease. "This paper is very much a smoking gun as far as the Deepwater Horizon spill is concerned," said Chris Parsons, a professor of environmental science and policy at George Mason University. "But the unusual mortality event seems to have started before the Deepwater Horizon spill, and there may be other issues going on, too." Parsons noted that issues like shipping noises, toxic algal blooms and poor nutrition could make the animals more vulnerable to health problems, too.